Top Rated Local® is pleased to announce that The Moving Guys, LLC is a 2019 award winner for moving companies in South Dakota! For moving services you can rely on in Sturgis, there’s no better company to turn to than The Moving Guys, LLC. The Moving Guys, LLC has received dozens of reviews on three verified sites with an average rating of 4.86 stars, earning them a tremendous Rating Score™ of 95.55 and a 2019 Top Rated Local award for ranking among the top 10 moving companies in all of South Dakota! “These guys were great; they were running late due to a previous job but maintained communication with me at all times. They also sent twice the number of guys without charging extra to make up for it and did the move in a flash. Everyone was very professional and courteous, I would definitely recommend this company for your moving needs. I know things don’t always go as planned and one job may run into the next, but what makes a great company is communication and the desire to make things right. The Moving Guys did both. [I am] very pleased with their work!” – Steve G.
Chad Moyers, the owner of The Moving Guys, generously gave us a few minutes of his time to tell us about his award-winning business and its incredible online reputation. 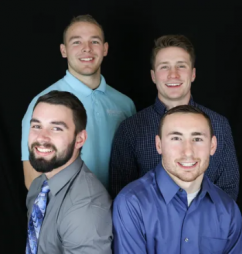 The first question we had for Chad was what is it that sets The Moving Guys apart from the many other moving companies people could work with in South Dakota. Chad told us that they are a small-town, local company that they started from the ground up. They work hard to be personable with every customer and take the stress out of the move as much as they can. They do a good job of keeping in contact, and Chad’s crew members are well-trained and friendly. Outside of building a powerful online reputation, The Moving Guys has gotten most of their business from repeat customers and referrals; they’re also fortunate enough to have rather large accounts under their belt, which definitely speaks to their work quality! Congratulations to the team at The Moving Guys, LLC for being a 2019 Top Rated Local award winner, and thank you so much, Chad, for taking the time to speak with us! We highly recommend The Moving Guys, LLC in Sturgis. Visit their website today! 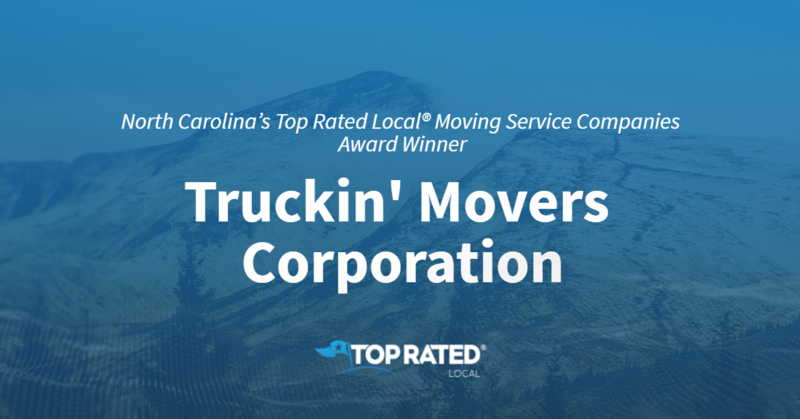 Top Rated Local® is pleased to announce that Truckin’ Movers Corporation is an award winner for moving service companies in 2019. If you are looking for a moving service company that will make your next move a breeze, look no further than this award-winning company! Truckin’ Movers Corporation has received many overwhelmingly positive reviews across five different verified sites with an average rating of 4.68 stars, earning them an impressive Rating Score™ of 96.82 and a 2019 Top Rated Local award for ranking as one of the top five moving service companies in North Carolina! “I had to move twice within three months. I chose Truckin’ Movers for the first move and was so impressed with the customer service provided by the office and the care provided by the moving crew. The crew treated my furniture with care and were very gentle with moving the items. There were zero dings or dents in the furniture or the walls. I was so impressed that I decided to move with them again. I received the same high level of professionalism and care. I highly recommend this company!” – L.H. It is because of excellent reviews like this that Truckin’ Movers Corporation is now able to call themselves a Top Rated Local award winner! We were excited to learn all about how Truckin’ Movers Corporation has been able to build such an impressive reputation, so we sat down with the President and General Manager, Doug Carlton. The first thing we wanted to know was what it is that makes Truckin’ Movers Corporation stand apart from their local competitors. We learned that they offer a damage-free bonus, which shows how willing they are to stand behind their services and their team. They also make sure that their employees are treated well and are incentivized to do great work. Because of this, they have a low turnover rate and high morale. Congratulations to Truckin’ Movers Corporation for being a 2019 Top Rated Local award winner, and special thanks to Doug for taking the time to speak with us! 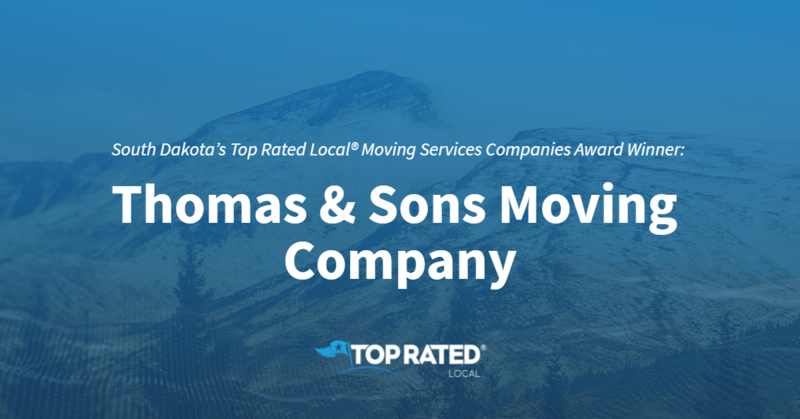 Top Rated Local® is pleased to announce that Thomas & Sons Moving Company is a 2019 award winner for moving service companies in South Dakota! When you rely on the experts at Thomas & Sons Moving Company in Rapid City, your next move will be easy and stress-free. Thomas & Sons Moving Company has received more than 100 reviews on three verified sites with an average rating of 4.97, earning them a tremendous Rating Score™ of 96.72 and a 2019 Top Rated Local award for ranking among the top 10 moving service companies in all of South Dakota! “[I had a] great experience with this company. We have moved six times in the last 10 years, and [this is,] by far, [the] best move! We had three great guys. [They were] very careful and efficient. I would highly recommend using this company. Also, I called, and they were able to do the move within a week. That was great. Thank you.” – Kate S.
In order to learn a little more about this one-of-a-kind business and its stellar online reputation, we took a few minutes to talk with Julie Farrell, Operations Manager at Thomas & Sons Moving Company. Outside of building a powerful online reputation, Thomas & Sons Moving Company gets their name out there with their branded trucks that act as moving billboards. Congratulations to the team at Thomas & Sons Moving Company for being a 2019 Top Rated Local award winner, and thank you so much, Julie, for taking the time to speak with us! We highly recommend Thomas & Sons Moving Company in Rapid City. Visit their website today! Top Rated Local® is pleased to announce that Green’s Moving & Storage is a 2019 award winner for moving service companies in South Dakota! 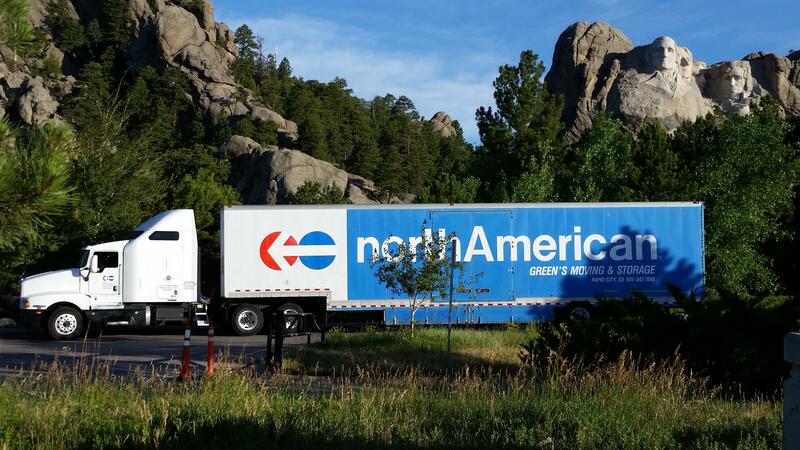 For all of your moving and storage needs in Rapid City, there’s no better option than Green’s Moving & Service. Green’s Moving & Storage has received dozens of reviews on four verified sites with an average rating of 4.74 stars, earning them a wonderful Rating Score™ of 90.61 and a 2019 Top Rated Local award for ranking among the top 10 moving service companies in all of South Dakota! 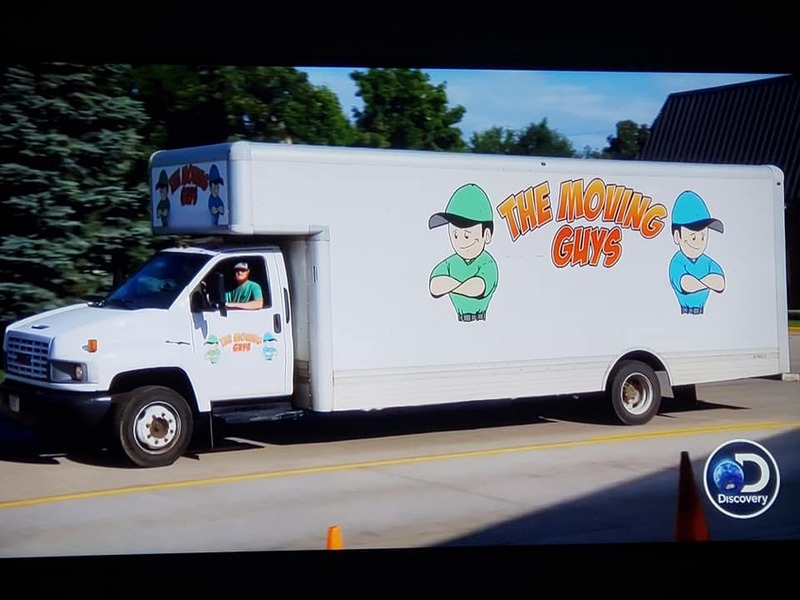 “[They are the] best movers ever! Don and his crew were truly outstanding. We’ve moved cross-country a lot, and Green’s Moving & Storage did a better job that anyone else by far. They were on time (or early! ), extremely professional, friendly, polite, positive, hard-working and made moving as pleasant — and fun — as it could possibly be. Everything was carefully wrapped, and it all arrived in great shape. We would recommend them to anyone!! Thanks so much! !” – Holly Q. In order to learn a little more about this award-winning business and its superb online reputation, we took a few minutes to talk with Don Meis, the owner of Green’s Moving & Storage. To kick off our conversation, we asked Don what it is that sets Green’s Moving & Storage apart from their competition in South Dakota. Don points to the fact that they have been in business since 1956, that they have high-quality bans and that they are a legitimate moving company with custom trucks that have air suspension. The next question we had for Don was what is Green’s Moving and Storage’s mission and how do they work to make the world a better place. Don shared with us that they provide a necessary service and that they do it in the best possible manner. Don attributes Green’s Moving & Storage’s strong online reputation to the quality labor and hard work they provide, and said that all of their reviews are genuine. Outside of building a powerful online reputation, Green’s Moving & Storage has spread the word about who they are and what they do through listings in the phonebook and by handing out flyers in various locations. Congratulations to the team at Green’s Moving & Storage for being a 2019 Top Rated Local award winner, and thank you so much, Don, for taking the time to speak with us! We highly recommend Green’s Moving & Storage in Rapid City. Visit their website today! 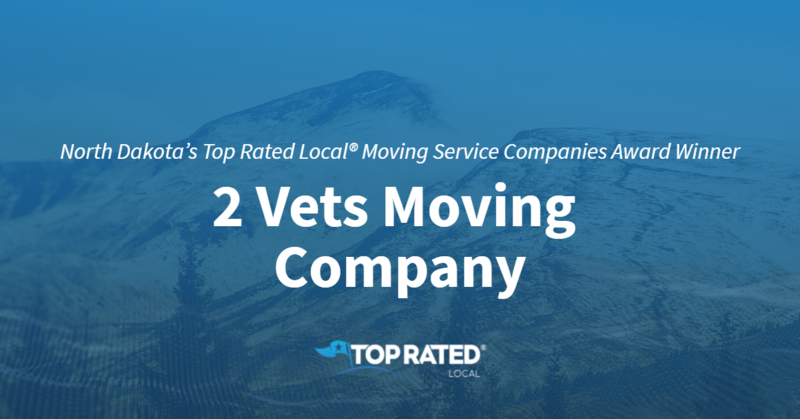 Top Rated Local® is pleased to announce that 2 Vets Moving Company is not only the number one moving company in North Dakota, but one of the top 50 businesses in the state overall! “We were so impressed with the service with 2 Vets Moving Company! They were friendly, efficient and careful. They were very careful with all of our furniture and boxes and they made sure all of our things made it into the new house without and damage. Thank you 2 Vets Moving Company and a special thanks to [the guys we worked with]! You can’t go wrong choosing them when you need help moving!” -Lisa B.
That’s just one of the many impressive online reviews 2 Vets Moving Company has received on verified review sites, giving them a 97.00 Rating Score™, a 5.00 average star rating, and a 2019 Top Rated Local award! We got a chance to speak with Brady Wolf, the owner of 2 Vets Moving Company, about his business’ marvelous online reputation. The following is Brady’s advice to other businesses that are working on their online reputation. Congratulations to the team at 2 Vets Moving Company for being a 2019 Top Rated Local award winner, and thank you so much, Brady, for taking the time to speak with us! 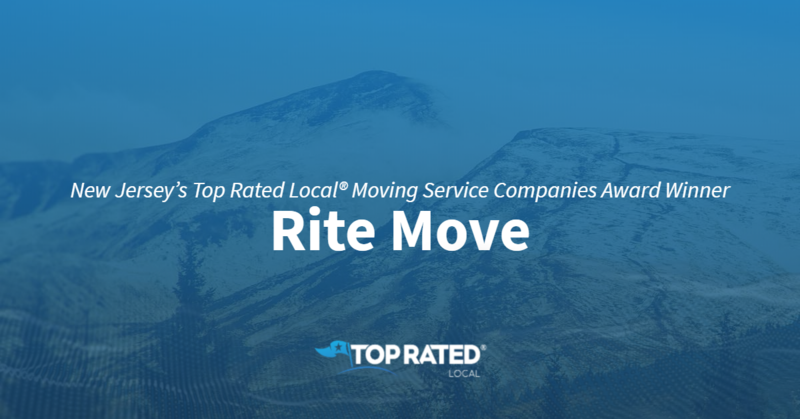 Top Rated Local® is pleased to announce that Rite Move is a 2019 award winner! “I had a good experience with Rite Move. I called the office to get an estimate and how much it would cost to move my house, they were reasonable with me. The guys were very honest and very professional in the work they do. I would definitely recommend them to help you move.” -Angelica A.
Joseph Potenza, the owner of Rite Move, took some time to speak with us about his business’ outstanding online reputation. According to Joseph, the Rite Move mission is actually relatively simple. They just want to help people have a better moving experience by being great at what they do. Congratulations to the team at Rite Move for being a 2019 Top Rated Local award winner, and thank you so much, Joseph, for taking the time to speak with us! Minnesota’s Top Rated Local® Moving Service Companies Award Winner: Matt’s Moving LLC. Top Rated Local® is pleased to announce that Matt’s Moving LLC. is a 2019 award winner for moving service companies in Minnesota! Whether you are moving to Minneapolis or Saint Paul, Matt’s Moving LLC. can get you moved there. Matt’s Moving LLC. has received dozens of reviews on three different verified sites with an average rating of 4.64 stars, earning them an incredible Rating Score™ of 93.38 and a 2019 Top Rated Local award for ranking among the top 10 moving service companies in all of Minnesota! “We used Matt’s Movers to move my mom from Cottage Grove to Little Canada. These three guys were very professional and worked well together. They made sure everything was right where we wanted it before they left. I would highly recommend this company to handle all your moving needs!” -Juliann H.
We wanted to learn a little more about this award-winning business and its impressive online reputation, so we took a few minutes to talk with Jake Oxendale the marketing director at Matt’s Moving LLC. Outside of building a powerful online reputation, Matt’s Moving LLC. has gotten their name out there through developing relationships directly and focusing on some online marketing. The 11-year-old business is also looking to build an app that they can sell to other moving companies. The hope is that this app will provide outstanding communication throughout the entire moving process. 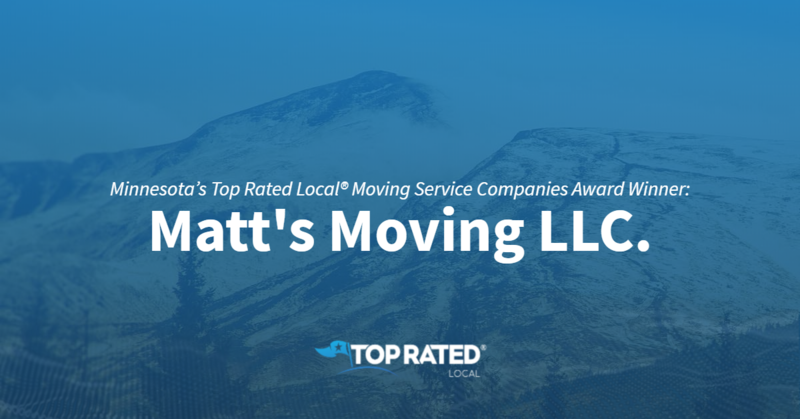 Congratulations to the team at Matt’s Moving Company for being a 2019 Top Rated Local award winner, and thank you so much, Jake, for taking the time to speak with us! Visit their website here! Top Rated Local® is pleased to announce that Two Men and a Truck of Rochester Hills is a 2019 award winner for moving service companies in Michigan! Make your next move stress-free by relying on the expert at Two Men and a Truck in Rochester Hills. 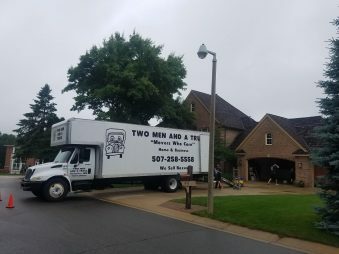 Two Men and a Truck of Rochester Hills has received more than 125 reviews on three verified sites with an average rating of 4.89 stars, earning them a spectacular Rating Score™ of 94.88 and a 2019 Top Rated Local award for ranking among the top 10 moving service companies in all of Michigan! “The moving crew assigned to our move from Two Men and a Truck was excellent. They treated every item with care, had a great attitude and made [our] moving day much easier and enjoyable. All three of the movers were great people and were having fun doing what they do. No items were damaged in the move, and they accommodated any request we had. Great work!” – Mike S.
Dustin Blakemore, the General Manager at the Rochester Hills location of Two Men and a Truck, generously gave us a few minutes of his time to tell us a little more about this award-winning business and its stellar online reputation. When asked about their secret to such a strong online reputation at Two Men and a Truck of Rochester Hills, Dustin told us that they are dedicated to providing good customer service from the very beginning. Outside of building a powerful online reputation, Two Men and a Truck of Rochester Hills has gotten their name out there through community involvement, including working with Movers for Moms® and collecting items every year to donate to a shelter for victims of abuse. Congratulations to the team at Two Men and a Truck of Rochester Hills for being a 2019 Top Rated Local award winner, and thank you so much, Dustin, for taking the time to speak with us! We highly recommend Two Men and a Truck of Rochester Hills. Visit their website today! Top Rated Local® is pleased to announce that Midwest Moving Company is a 2019 award winner for moving service companies in Minnesota! 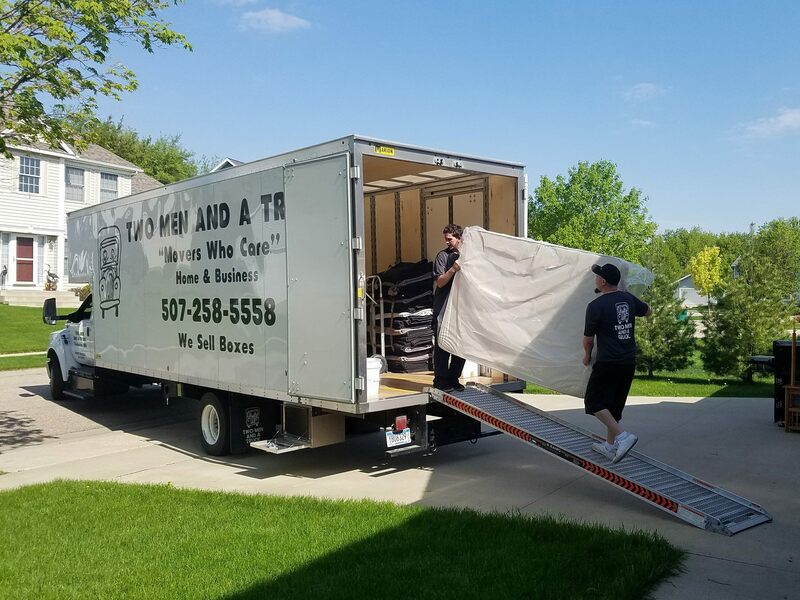 If you are scheduling a move and need a professional who comes highly recommended, make sure to check out Midwest Moving Company out of Moorhead. Midwest Moving Company has over 100 reviews on 3 verified sites with an average rating of 5.00 stars earning them an incredible Rating Score™ of 96.96 and a 2019 Top Rated Local award for being one of the top 10 moving service companies in the entire state of Minnesota. “Midwest Moving Company was absolutely great! I called three other moving companies in the area and they were able to give me the best quote out of all of them, which they ended up sticking to. The movers were terrific and communication from Matthew leading up to and following the move was great. I couldn’t have been happier with how the entire process from start to finish went. I would highly recommend to anyone!” – Jordan S.
We took a few minutes to speak with Matthew Dorso, owner of Midwest Moving Company, to learn a little bit more about the business and how they managed to build such an astounding online reputation. We also wanted to understand what Matthew and the rest of his team’s mission is every single day. Matthew explained that their mission is to be the biggest and best moving company in the entire Midwest. In order to do that, Midwest Moving Company focuses on minimizing the stress levels of their client through constant communication and high energy throughout. Outside of simply building a strong online reputation to grow the business, Midwest Moving Company makes sure to have a presence through numerous channels online, including Google and Facebook. Also, keep an eye out for their billboards around Moorhead! Congratulations to the team at Midwest Moving Company for being a 2019 Top Rated Local award winner, and thank you so much, Matthew, for taking the time to speak with us! Learn more about this business online today. 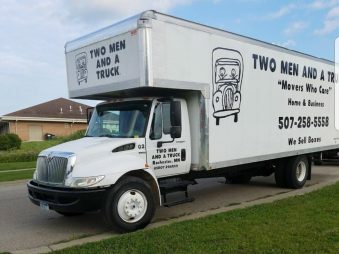 Top Rated Local® is pleased to announce that Two Men and A Truck is a 2019 award winner for moving service companies in Minnesota! If you are looking for a top notch moving company in Rochester, we highly recommend checking out the award winning Two Men and A Truck. Two Men and A Truck has over 250 reviews on 3 verified sites with an average rating of 4.88 stars earning them an astounding Rating Score™ of 94.80 and a 2019 Top Rated Local award for being one of the top 10 moving service companies in the entire state of Minnesota. “The guys who did my move were great! They were friendly, efficient and professional. The crew finished in only two hours (which saved me money), everything arrived in one piece and they were both pleasant throughout. Great service!” – Renee B. We took a few minutes to speak with Alexis Burdick, marketing manager of Two Men and A Truck, to learn a little bit more about the business and how they managed to build such an incredible online reputation. We also wanted to understand what Alexis and the rest of her team’s mission is every single day. Alexis stated that the core purpose of Two Men and A Truck is to move people forward. Based on the reviews online, the company is living that philosophy everyday. Outside of simply building a strong online reputation to grow the business, Two Men and A Truck involves themselves in the community to help drive client growth. Alexis believes that a customer referral is the best prospective client they can get. Congratulations to the team at Two Men and A Truck for being a 2019 Top Rated Local award winner, and thank you so much, Alexis, for taking the time to speak with us! Learn more about this business online today.